In brief: Tahiti’s Niuhiti Buillard and hometown world number one Annabel Anderson have taken out the 2016 King & Queen of the Harbour race in Auckland, New Zealand. 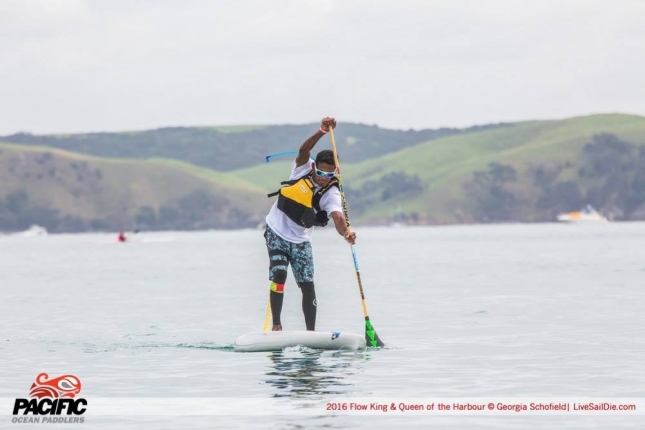 The annual SUP and surfski race is billed as a downwinder, however this year the water was almost dead flat, making it an absolute grind along the 23km course between Auckland and Waiheke Island (though it was probably a km or two shorter judging by the times). Niuhiti crossed the line in 1:47:32, just half a minute ahead of JP Tobin, while Sam Thom rounded out the podium a further minute adrift. Annabel comfortably took out the women’s, finishing 10 minutes clear of runner-up and fellow Molokai podium-getter Penelope Strickland. However just like she’s done so many times before, Annabel also beat home most of the men. Her time of 1:49:38 was just half a minute shy of the men’s top three, and it was only two minutes off the winning pace. For a near-two hour race, that’s mighty impressive. There was also another in-form stand up paddler on the podium, only in a different division; Michael Booth, the Aussie dark horse that’s been on an unstoppable run lately, finished second in the men’s surfski race (just seconds behind the winner). Boothy has a strong background in ocean ski racing, which helps explain the Starboard team rider’s meteoric rise through the ranks of the SUP racing world. Top 10 below. Click here for full results, and hit Facebook for a bunch of cool race shots.